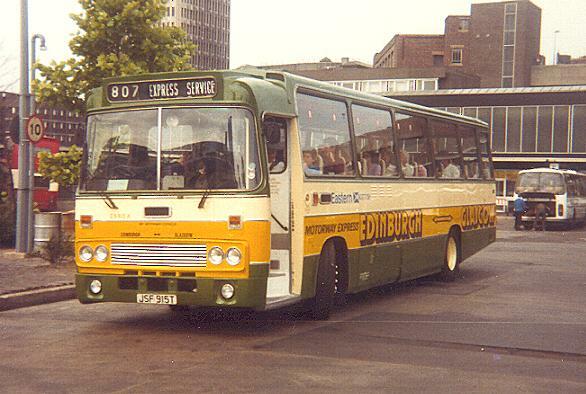 The Scottish Bus Group (SBG) operated over 200 Alexander T-types in their heyday. The body was designed as a dual-purpose coach and was in production for seven years from 1976 to 1983. Chassis to receive the body were mainly Leopards and Seddons although some Tigers were also included at the end. Only a handful now remain in service. Above: First Edinburgh Leopard 416 (ULS716X) in Buchanan Bus Station, on the 24 from Glasgow to Stirling, formerly the 14 to Dunfermline. April 2000. Above: First Lowland Seddon 1665 (DSD965V) on the 34 to Duns in the bombsite that is Berwick-Upon-Tweed bus station in April 1999. Left: A row of Stagecoach Fife T-type Leopards tucked away at the back of Kirkcaldy depot in April 1999. They are 291 (RSC191Y), 273 (NFS173Y), 277 (NFS177Y) and 276 (NFS176Y). Left: Some T-types have already made it into preservation. Former Midland MPE265 (GLS265S) has been restored by Tom Hamilton and is seen at Showbus in September 1998.